Posted on Tuesday, July 16th, 2013 at 12:19 pm. This Discover Cooking with California Olive Oil Recipe Contest submission comes from Margee Berry, a We Olive Costa Mesa customer. 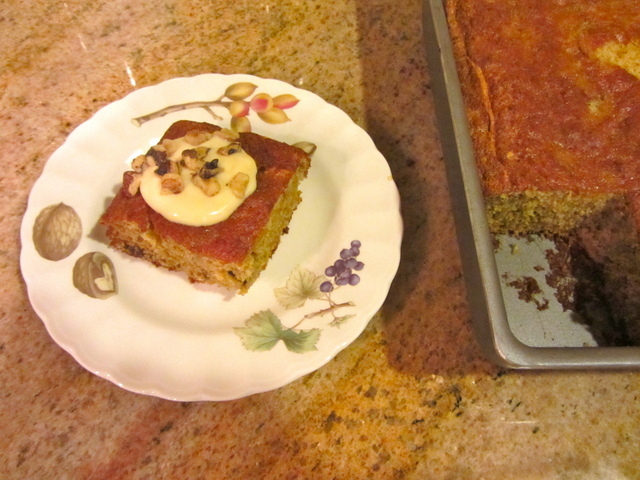 Fig preserves, ground walnuts, citrus and olive oil make up the flavors of this cake. The topping is lemon curd whisked into crème fraîche. Preheat oven to 350F. Grease sides and bottom of an 8-inch square baking pan with the 1 teaspoon olive oil. Beat egg whites and 1/3 cup sugar in a medium bowl with mixer on high speed until stiff peaks form. In a medium bowl whisk flour, cornmeal, ground walnuts and baking powder. In a large bowl whisk egg yolks, orange juice and lemon juice; stir in fig preserves until blended. Stir in flour mixture then fold in egg whites just to combine. Transfer batter to cake pan, bake until cake is golden about 30 minutes. Let pan cool on wire rack. In a small saucepan over medium heat combine vinegar, orange peel and remaining sugar until slightly syrupy about 4 minutes swirling saucepan a few times; brush mixture on top of cake. Place chopped walnuts in a small skillet over medium heat. Shake skillet often until walnuts are golden all over about 4 minutes. To serve in a small bowl whisk Creme Fracihe and lemon curd. Cut cake into squares, top each with a large dollop of crème fraîche and sprinkle with toasted walnuts.